John, i would have thought that was the Reebock stadium. Sorry John i,ve looked again and it looks like the DW. It was the hills at the back that threw me. Home to THE best rugby league team on the planet. Remarkable ! John. Did you have long to wait for the "floodlight" !! Bradshaws Girl, today`s RL game is totally different from that when I was a keen supporter in the forties, fifties and sixties - the Aussie`s ruined it !! Why bother with a scrum? The ball had to go between the hookers or else it was a free kick in my day. Roy, the Reebok's a different shape, and my zoom lens ain't that good!! Ernest, the setting sun was just right, you can see Haigh Hall half lit in the background too!! You can just about make out the red warning lights on the Winter Hill mast too!! Good light. It reminds me of the photography book, Waiting for the Light, the author sometimes waited days just to get the right moment. John, I had the opportunity, in 1964, to go to the top of the Winter Hill mast (there`s a lift inside), as I played a lot of golf with the chap in charge of it`s construction. I refused as I`ve no head for heights. Enjoy flying though !! Ernest Pyke, you have raised a very interesting issue, that I am unable to get any sort of clarification on. Just what the hell has happened to the scrum feed in Rugby League? I remember very well in the late fifties early sixties, that if the ball wasn't put into the scrum evenly between the two hookers, a penalty was given for "Feeding". I can't see the point of a scrum at all with the way the scrum feed is now, it's absolutely pathetic, it would be just as well to give the opposing team the ball and stop waisting everyones time with this farce of a so called scrum. What am I missing? have the rules changed? Any info will be appeciated. Syd, you are talking about a time when the ball had LACES. Like many other sports, Rugby League has moved on. Not always for the better, I must agree. for gods sake this is a picture of the home of rugby league not a piccy of a scrum. so why as a good piccy been ruined with chat about hookers ball feeding and the likes of ? get with the game plan people and sit back and enjoy the view and not talk s@#t NUFF SAID . Whilst i agree with all your comments regarding the scrum and the game as a whole we still need to retain the 'scrum' as a way of restarting the game. Would you like to see the scrum farce that is in Rugby Union, it takes 3 or 4 attempts and around 3 minutes to set every scrum and then the outcome is usually a penalty to one side or the other after all the messing and mauling and if it is a successful scrum the ball has always been 'fed'. No i dont like today,s scrums but at least we dont spend 25% of the game stopped. By the way i thought the 'subject' was John,s photo, sorry John. not enough bird photos on here now!! Why no mention of the Latics? philra. I sent two only last week. I think Brian has been intimidated. Just been watching a programme about Sidney harbour bridge !! 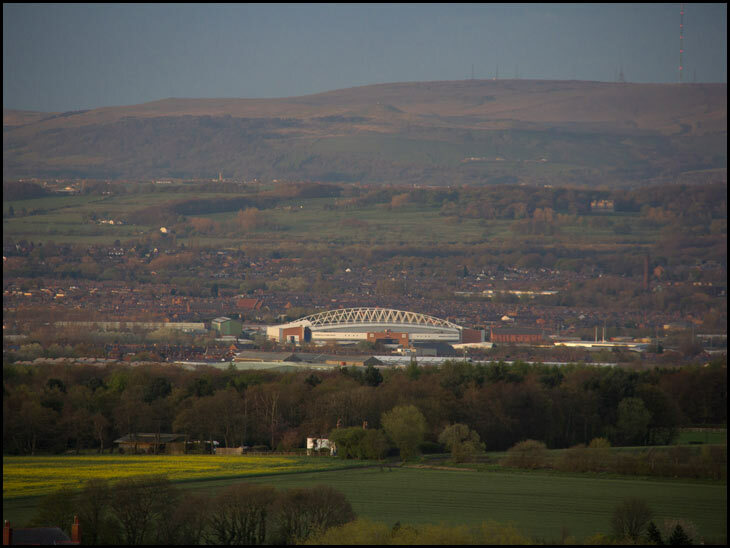 I dont like Rugby but I love this photo the view is amazing - however lets not forget that is Latics stadium for Premier League Football & Rugby are just Tenants!!!! Warriors will be there with 15,000 watching them when Latics are in the Championship with 7,000 watching them V Burnley etc in the not too distant future. They,ve had a good run but they,ll bite the dust soon. Dirty Harry,the home of Rugby League was Central Park! fred your so right . wash my mouth out. Red Stripe,You might be surprised to learn that Mr. Whelan owns the stadium and BOTH the Warriors and Latics are tenants!They each pay a percentage of gate receipts to Mr. Whelan.so put your blue kit away. That's Wiganworld for you, always off-topic and arguing about having two top class teams in the same town!! Next time I'll try to get a bird, a view, both teams, a pie, a new building, an old building and some Uncle Joe's Mint Balls all in the same shot to please everyone!! Totally agree WCML, we should have stayed at Central Park instead of moving to the souless theatre that is the WD40 Stadium. I suppose you're going to tell me the rugby's destruction of the pitch is the reason for the 'Tics being where they are in the League ?. Nothing to do with being a poor team. The table dosn't lie. Now when Uncle Dave gets bored and takes his ball in, bye bye Latics !!! Roy I agree with you regarding scrums in rugby league they do seem a waste of time. But putting those aside, RL is still the best game in the world. I dont't like to see too many aussies on teams but their introduction and the changes in the game over the last few years have made it fast furious and fantastic especially when the Warriors are on the park! !